A 24-hour strike on Northern rail services will go ahead after talks broke down in a dispute over the role of guards. Rail, Maritime and Transport (RMT) union members are to walk out on Friday over staffing for trains due to come into service in 2020. It coincides with the first day of the Tour de Yorkshire cycle race. Northern said it expects to run "more than 40%" of its timetable and more than 300 rail replacement buses. The company, which serves routes across northern England, said the majority of services run will be between 07:00 and 19:00 BST. The union said it was "angry and frustrated" the company had rejected a proposal to invite Department for Transport officials to join talks aimed at reaching a solution. Mick Cash, RMT general secretary, said: "The responsibility for the inevitable disruption lies wholly with the company." He said the company was trying to "bulldoze through" plans for driver-only-operated trains. The Tour de Yorkshire cycle race starts in Bridlington, East Yorkshire and finishes in Scarborough, North Yorkshire on the day of the strike. Well over a million spectators turned out to see the 2016 race, organisers said. Talks about Merseyrail services between its management and the RMT union ended without agreement on Monday. RMT members also joined a national protest in London against driver-only-operation to mark the one-year anniversary of its dispute with Southern rail. 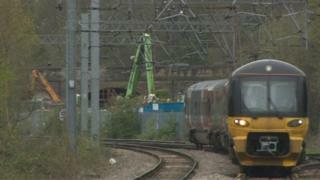 Arriva Rail North, which operates Northern trains, urged the RMT to "get back round the table". Richard Allan, its deputy managing director, said: "We believe we would keep a second person on many of our services and, at some locations, we may choose to staff the station to give better support to customers. "It is hugely disappointing that RMT is making demands rather than working with us to develop our plans."